Our self-help guide for families is now available in bookstores - Mom Always Liked You Best: A Guide to Resolving Family Feuds, Inheritance Battles & Eldercare Crises by Arline Kardasis, Rikk Larsen, Crystal Thorpe, and Blair Trippe, 2011. Elder Decisions® is approved to receive referrals from the Bristol, Middlesex, Norfolk, Plymouth and Suffolk Divisions of the Massachusetts Probate and Family Court Department. "Solving Sibling Squabbles Over a Parent's Care"
"Does Your Family Need a Referee for Caregiving Disputes? When siblings clash over caregving, you may need outside help"
"Mediation - A Resource for Helping Families Make Decisions Together"
"The Ties that Blind: Elder Mediators help brothers and sisters stop fighting and make decisions about aging parents"
"The Author Speaks - Caring for Our Aging Parents: An elder mediator and author helps siblings negotiate care for Mom and Dad"
"The Author Speaks - Excerpt - 'Mom Always Liked You Best: A guide for resolving family feuds, inheritance battles and eldercare crises'"
"Family Value: A Referee for Family Disputes"
Also titled "Mediators Increasingly Try to Help Families Resolve Conflicts Over Aging Parents"
"Mediators Help Families with Tough Choices of Aging"
"Siblings revive conflicts when parent care comes up"
"Mediators Ease Decisions on Elders: Mediators ease elder decisions"
"Elder and Family Mediation Services" by Arline Kardasis and Blair Trippe, LongTermCareLink.net, December 2005. 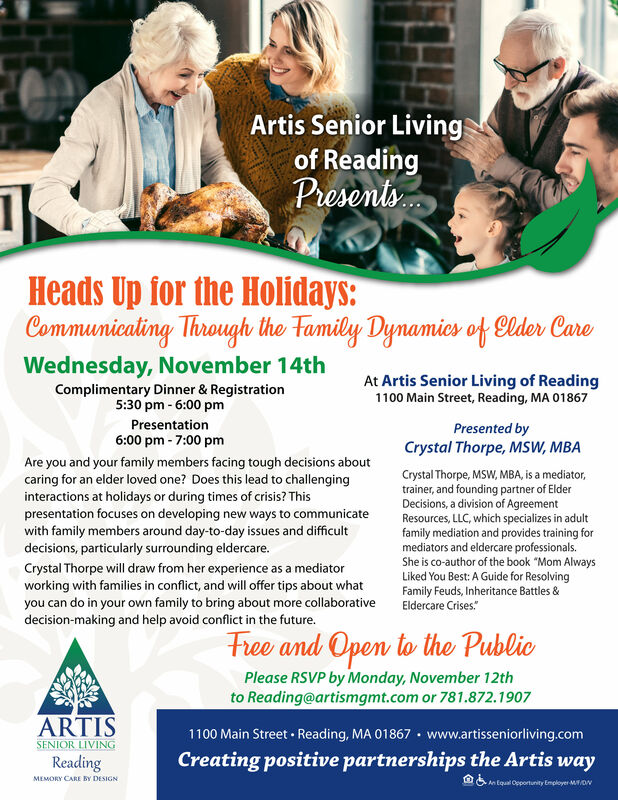 Crystal Thorpe led a workshop, "Heads Up for the Holidays: Communicating Through the Family Dynamics of Elder Care", held at Artis Senior Living of Reading, on November 14, 2018. On December 13, 2018, Crystal Thorpe led a workshop, "Navigating Family Conflict Around Aging Parents," held at Temple Emanuel in Newton, MA. The workshop was part of a series co-sponsored by Hebrew SeniorLife, the Newton Senior Center and the Temple Emanuel Senior Fund. Halee Burg and Crystal Thorpe joined a panel of colleagues to present the workshop: "Family Mediation: It's Not Just For Divorce Anymore" at the 2018 Annual Conference of the Academy of Professional Family Mediators held in San Diego, CA, on October 18, 2018. Halee Burg, Crystal Thorpe, and colleagues presented the workshop: "Family Mediation: It's Not Just For Divorce Anymore" for the Massachusetts Council on Family Mediation on April 11, 2018, in Wellesley, MA. Crystal Thorpe led two workshops on October 9, 2014, at the ACR 2014 Annual Conference in Cincinnati, Ohio, entitled "Elder / Adult Family Mediation – Challenges and Opportunities" and "Elder Mediation Story Swap." She also participated in a panel discussion on "Ethical Considerations for the Work We Do," held October 11th at the Elder Decision-Making & Advanced Practitioner Family Mediators’ Retreat, following the conference. Crystal Thorpe presented a workshop titled "Using Mediation to Resolve Elder/ Adult Family Disputes" at the NASW Massachusetts Chapter Symposium 2014 on April 4, 2014 in Framingham, MA. Crystal Thorpe presented on "Resolving Family Disputes" at Foxmoor Continuing Education’s Mass Health Update 2013, featuring Harry Margolis and William Brisk, held on October 25, 2013 in Waltham, MA. Arline Kardasis presented a workshop titled "Elder/Adult Family Mediation – Setting the Table for Success" at the Association for Conflict Resolution (ACR) 2013 Annual Conference, held October 9-11, 2013 in Minneapolis, MN. Arline Kardasis and Crystal Thorpe presented a workshop titled "An Adult Family Case Study: An Insider’s View" at the Second Annual Conference of the Academy of Professional Family Mediators – “Mediating in the Landscape of the Changing Family” – held October 3-6, 2013 in Denver, CO.
Arline Kardasis was a guest on The Texas Conflict Coach® Blog Talk Radio program on September 17, 2013 with guest host Zena Zumeta in the program: "Got Conflict around Eldercare and Estate Issues? Here’s a Guide for Resolution!" Crystal Thorpe presented "Communication when Connection is Lacking: Bringing adult family members to the table in the growing field of elder mediation" at the Regional Conference of the New England Chapter of the Association for Conflict Resolution – “Conflict, Communication and Connectivity: Navigating New Terrain in the Digital Age” – held June 14, 2013 in Sturbridge, MA. Crystal Thorpe co-presented with Jeffrey Bloom, Esq. of Margolis & Bloom, LLP, on "Sharing the Pie: Estate Planning Conflicts and Recipes for Resolution" for the Massachusetts Council on Family Mediation on December 12, 2012, in Wellesley, MA. Crystal Thorpe presented a workshop on "Managing Family Conflict So It Doesn't Derail Caregiving Decisions" at the 2012 Conference of the National Association of Professional Geriatric Care Managers - New England Chapter, held on November 5, 2012, in Marlborough, MA. Arline Kardasis and Crystal Thorpe presented a workshop on "Elder & Adult Family Mediation – Completing the Circle of Family Mediation Practice" at the Founding Conference of the Academy of Professional Family Mediators on September 28, 2012, on Cape Cod, MA. Arline Kardasis presented “An Introduction to Elder & Adult Family Mediation” at the April 18, 2012 meeting of the Rhode Island Mediators Association, held at Roger Williams University. She described the landscape of Elder and Adult Family Mediation and how it differs from other types of mediation, and shared her insights on why families come to mediation, who should be at the table, and the model her firm employs to serve clients. Click for details. Arline Kardasis presented a webinar for the National Association of Professional Geriatric Care Managers on March 7, 2012, titled Using Mediation with High Conflict Families. She shared her experiences as an Elder Mediator who has helped adult family members reach consensus on some of the most difficult decisions they have ever faced together. She discussed the types of disputes that GCMs have referred to her firm and explained why families get “stuck ” in a conflict. The program provided insights and techniques for GCMs to help them “think like a mediator” in order to uncover the interests that are at the heart of every dispute. She also discussed how to: convene a productive family meeting, determine who should be at the table, and craft an agenda that can create a roadmap to resolution. View details. Crystal Thorpe presented a workshop for residents and family members titled "Mom Always Liked You Best: Move Beyond Rivalries to Collaborate with Adult Siblings on Family Decisions" at Fuller Village in Milton on November 2, 2011. The program was co-sponsored by Partners HealthCare at Home. Arline Kardasis and Rikk Larsen discussed the book "Mom Always Liked You Best" at the Boomers and Beyond Special Interest Group teleseminar for healthcare professionals and caregivers on November 1, 2011. Blair Trippe discussed methods participants could use to help family members and/or clients resolve adult family conflicts at a program held the law offices of Margolis & Bloom, LLP in Boston on October 3, 2011. Blair Trippe and Rikk Larsen were interviewed about the book "Mom Always Liked You Best" on the WGBH television show, Greater Boston with Emily Rooney. The program aired on August 1, 2011. You may view the interview at WGBH.org. Arline Kardasis presented at the Association for Conflict Resolution's Family Section 2011 Conference - "A Family Odyssey" - in Minneapolis, MN. Her workshop, held on July 30, 2011, was titled Elder Mediation: Not your Grandmother’s ADR Process. On June 17, 2011, Arline Kardasis and Crystal Thorpe presented a workshop titled Elder/Adult Family Mediation: Not Your Grandfather’s Mediation at the Regional Conference of the New England Chapter of the Association for Conflict Resolution (NE-ACR). They discussed how to “Let the Forum Fit the Fuss” in this interactive workshop on the Hybrid Model of Elder Mediation, noting that to match problems to processes, effective practitioners in this burgeoning field will want to rethink their classic methodologies and consider a broad array of process models, interventions, styles, skills, and tools. Blair Trippe participated in a a LiBrA (Lives of Brearley Alumnae) panel entitled Informing Our Golden Years: Navigating the Complex Dimensions of Aging on November 8, 2010 at Brearley in NYC. The Golden Years provide opportunities, challenges and an ever changing landscape filled with decisions on a host of issues. From medical and insurance questions, to estate planning, to the practical issue of dealing with accumulated belongings, to managing family relationships as well as those with a range of professionals, the panel explored the complexities of living the best life while keeping families whole. Elder Decisions’ mediators Arline Kardasis and Blair Trippe joined Attorneys Lynda Robbins and Doug Reynolds to discuss how mediation and collaborative law can be used effectively to resolve elder law and probate disputes, in a program entitled: Solutions That Maintain Relationships for all Parties and Interests in Elder Law and Probate Disputes through Collaborative Practice and Mediation, at a meeting of MassNAELA on October 25, 2010. The program was moderated by Attorney Emily Starr. Arline Kardasis presented a talk at the third World Summit on Elder Mediation on May 10, 2010 in Chicago, IL. Her presentation, to an international audience of Eder Mediators, described the Hybrid Model of Dispute Resolution developed by Elder Decisions for complex elder mediation cases. These cases are often multi-party and multi-issue with geographically dispersed stakeholders who have long-standing and entrenched relationships. Arline Kardasis, a founding partner at the firm, discussed this model which draws from a variety of dispute resolution processes, including: mediation, consensus building, facilitation, dispute systems design and coaching - all in the service of "interest based" negotiations. Arline Kardasis and Blair Trippe presented at the American Bar Association Midyear Meeting on February 13, 2009 in a program co-sponsored by the ABA Section of Dispute Resolution, the ABA Commission on Law and Aging and the ABA Senior Lawyers Division. Their session was entitled: Elder Mediation: The Challenges and Rewards of this Evolving Practice Area. The session highlighted the challenges of working with adult families in multi-party disputes around care giving, estate planning, inheritance matters, living arrangements and other issues brought on by aging. Topics covered included: presenting issues; characteristics of adult mediation; who should be included; when the elder does not/should not participate; obstacles to and strategies for bringing parties to mediation; ethical challenges; and defining success. The program was held at the Hynes Convention Center in Boston, MA, and simultaneously via teleconference. Arline Kardasis and Blair Trippe presented a teleconference to the Family Section of the Association for Conflict Resolution on February 4, 2009 entitled Elder Mediation: Reconsidering Principles and Practice to Accommodate Family Conflict around Aging Issues. In the session, Arline and Blair discussed Elder Mediation, an evolving practice area for family decision-making around issues triggered by the aging process: care giving, housing changes, medical decisions, safety concerns, finances/estate planning, etc. As elder mediators face logistical and ethical challenges that are specific to these adult family conversations, this program focused on: characteristics of elder mediation; who should be included; capacity of the elder to participate in mediation; obstacles to and strategies for bringing parties to mediation; and ethical challenges. The Program on Negotiation at Harvard Law School (PON) featured the Elder Decisions team in a panel presentation on Elder Mediation: An Evolving Practice Area for its April 16, 2008 Dispute Resolution Forum. The panel described their work in this emerging field and shared some preliminary conclusions about well-considered and innovative dispute intervention processes appropriate for adult family conflicts. Panelists included Arline Kardasis, Rikk Larsen, Crystal Thorpe, and Blair Trippe, all founding partners of Elder Decisions, along with the Honorable John R. Maher (ret. ), who recently joined the Elder Decisions team. The Program on Negotiation at Harvard Law School (PON) is a world-renowned interdisciplinary center on negotiation and conflict resolution. On April 13, 2007, Arline Kardasis and Blair Trippe presented a workshop entitled "Elder Mediation: A Valuable Resource for Resolving Disputes Involving Elders and Their Families" at the 23rd annual conference of the National Association of Professional Geriatric Care Managers, Inc. For more information, please visit www.caremanager.org. On March 20, 2007, Rikk Larsen spoke at the Massachusetts Bar Association Probate Litigation Section seminar for probate lawyers and elder law attorneys on elder law and probate mediation. Rikk Larsen was the featured speaker at the Margolis & Associates First-Thursday Breakfast Series on November 2, 2006, speaking on "Mediating Family Conflicts Over Care Issues." He discussed a new field developing in the mediation world – Elder Mediation. Elder mediation is proving to be an effective way for families, dealing with complex emotional decision processes, to efficiently and safely make tough choices. This is especially true at the beginning of the decision process – when families are fact finding, struggling with options and discovering feelings about their parents or adult children that well up and make clear thinking difficult. Arline Kardasis and Rikk Larsen presented a workshop at the Association for Conflict Resolution (International) Family Section Mid-Year Conference on July 13 – 16, 2006. The workshop was entitled "The Emerging Field of Elder Mediation: It’s Unique Challenges and Remarkable Rewards." Topics included: mediator advocacy for the welfare of the senior; when and how to include elders in the mediation sessions; working with large and widely dispersed family groups; barriers to participation; new strategies for intake; who pays for mediation; and when to offer conflict coaching to family members. Please visit: http://www.acrnet.org/. Blair Trippe was the featured speaker at a recent meeting of the local chapter of More Than Money. Her presentation, Elder Mediation: Facilitating Difficult Family Decisions, described how this dispute resolution process helps families cope with the complex and emotional issues surrounding major life changes. She discussed difficulties families face in dealing with issues related to aging family members (e.g., health care, giving, conversations about money, potential loss of financial control and changes in living situations). Blair also discussed the mediation process. The More Than Money Institute is a national nonprofit organization committed to creating a better, more caring society by supporting people as they explore the impact of money in their lives and act on their highest values. Please visit http://www.morethanmoney.org/. On October 17, Arline Kardasis and Rikk Larsen were interviewed on Lawline, a Newton, Massachusetts Cable TV program. The host, attorney B.J. Krintzman, led a rich discussion about the role of mediation in resolving family conflicts concerning eldercare and estate issues and the importance of elder mediation to the growing population of baby boomers and their aging parents. The program was aired more than 20 times over several weeks during the Fall of 2005. At the 2005 Dartmouth Alzheimer’s Conference, at the Dartmouth-Hitchcock Medical Center in Lebanon, NH, on October 29, Blair Trippe and Rikk Larsen presented a workshop entitled “When Families Struggle with Dementia: Facilitating Solutions through Mediation.” Participants included primary care physicians, psychiatrists, neurologists, geriatricians, registered nurses, social workers and nursing home administrators. On November 7, John Dugan and Arline Kardasis presented a program entitled “When Aging Issues Lead to Family Conflict: Resolving Conflicts through Mediation” at the University of Massachusetts Boston. The program was sponsored by the Graduate Programs in Dispute Resolution at the College of Public and Community Service along with the Gerontology Institute and Department at the McCormack Graduate School of Policy Studies. Blair Trippe and Rikk Larsen of Elder Decisions presented a Pre-Dinner Program entitled “Using Mediation in Elder Law” at the April 26 Meeting of the Massachusetts Chapter of the National Academy of Elder Law Attorneys (www.manaela.org). The program was held at the Boston Marriott Newton Hotel, 2345 Commonwealth Avenue, Newton, MA. John Dugan and Arline Kardasis of Elder Decisions presented a workshop entitled "Mediating Family Disputes Involving Elders" at the Spring 2005 Conference of The New England Chapter of the National Association of Professional Geriatric Care Managers. The conference was held on April 4 at the Radisson Hotel in Marlborough, Massachusetts, and was entitled "Geriatric Care Management: The Complexities of Caring." Details are available at www.gcmnewengland.org. Blair Trippe and Rikk Larsen of Elder Decisions presented a program on Elder Mediation at the December Members Meeting of the Massachusetts Council on Family Mediation, on December 15 at the Concord Courthouse in Concord, MA.